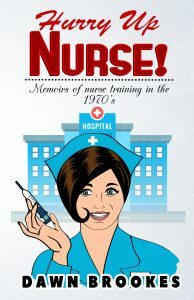 If you have ever worked or been in hospital or if you are someone who loves medical and nursing biographies, you will love this raw and original book because it provides a real insight into hospital life back in the day. The book follows the author’s experiences as she and her friends come to terms with the non-stop hustle and bustle of hospital life. As you are drawn into the book you will be introduced to many unforgettable patients’ and their stories, while getting to know a cracking good storyteller, when you follow her onto the hospital wards. Dawn shares the discipline, laughter and inevitable sadness as she learns to cope with the strains of shift work. It also highlights the domineering presence of the Ward Sister during that era. ‘WELL LEARN!’ She shouted and stormed of up the ward. The chapters are separated into ward placements and the experiences of caring for patients in each of these different environments draws you in and helps you to understand what the student nurses’ went through during their training. The most challenging placements are shared with humour and understanding, acknowledging her weaknesses. remember, she writes, she is still a teenager coming across daily what most people will not experience in a lifetime. As well as providing an insight into nurse training, Hurry up Nurse,is a warmly written medical biography that treats us to a glimpse into the social history of life in the 1970s and early 1980s. This funny & poignant nursing memoir will make you laugh and make you cry. Pick up this page turning book today. “A wonderfully crafted book that resonated deeply…BL. Very pleased to discover this bright new star. L.
Easy to read, enjoyable and very funny. P.M.